1390 gram carbon wheels can make your 27.5 bike fly. SRAM has been busy developing a whole new line of wheels and we’re pleased to announce the launch of their Rise 60 wheels. These are XC/Trail wheels that feature a carbon, hookless rim with 21mm internal width. Weight is 1390 grams for a pair of 27.5 wheels and 1430 grams for the 29er version. MSRP is $1990 a pair for either wheel size. 1×11 XD Driver or 1×10 standard cassette versions are available at the same price. The tubeless kit and all the popular axle end caps are included with the wheelset. The big news here is SRAM is going with a hookless rim profile now. This increases strength and reduces manufacturing cost for the rim. An in our experience, performance is not compromised as hookless wheel and tire hold pressure just as well as hooked rim systems as long as the tire is tubeless or tubeless ready with the proper tire bead diameter. 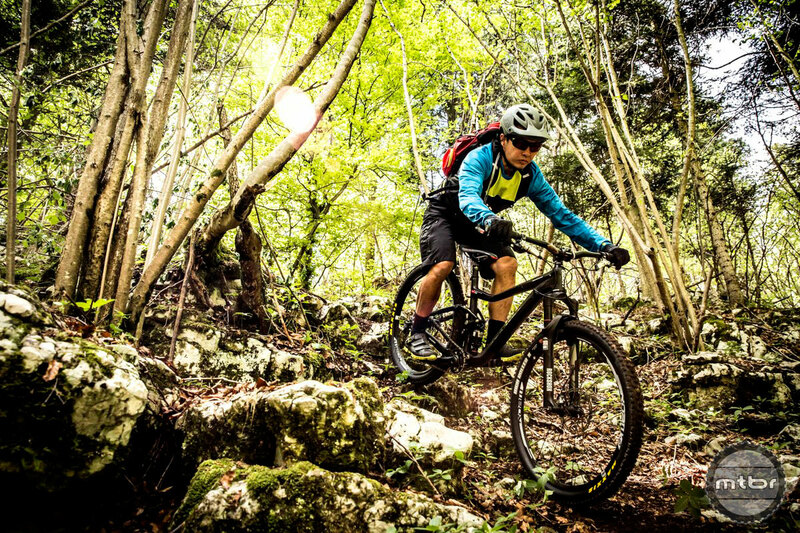 What does SRAM know about wheels? This is a valid question and they know a lot actually. They’ve built an engineering team based in Colorado Springs, CO and they are entirely dedicated to developing excellent wheelsets at many different price points. In their first efforts in 2012, the wheels weren’t quite dialed but they’ve learned a lot since then. Their design directive is ‘balance’ since they want the rim, spokes, hub and wheel build to be tuned around the type of riding the wheel is designed for. We’ve tested their Roam 30 and Roam 60 wheels for the past year we’ve found no weaknesses so far. Ride quality has been A+ and reliability has not been an issue. Of course we’ve wished for a lighter wheel sometimes and it looks like the Rise 60s fit the bill. Instead of 18mm internal width, it is now 21 mm. And with a hookless rim, it may measure out wider than that. But it is nowhere near a 30mm internal rim width, which seems to be all the rage these days. 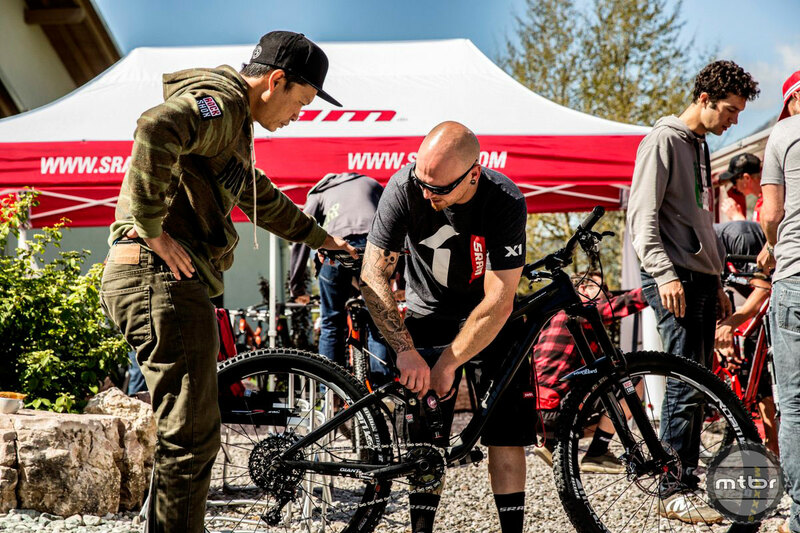 SRAM is looking in to the real physics and effects on tire traction with all these wide rims and may offer products in the future if they see an advantage. So far we’re happy to see a serious player in the wheel arena and we like that they’re producing good wheels at many different price points. They have a 26 option, I have them on my XTC, they’re awesome! “The big news here is SRAM is going with a hookless rim profile now. This increases strength and reduces manufacturing cost for the rim.” I guess the saving is the $10 discount from a round $2000 for two wheels? I just don’t get it. Who is buying these off the shelf 2k wheels? For half the cost I can have fully custom hand built wheels that are as light, more durable, and much sexier. I just don’t get it. Not embracing wider widths is a HUGE mistake for SRAM. Anyone buying aftermarket carbon rims these days are looking for width to go with that light weight, plain and simple. If they can’t figure out a quicker to market plan than a bohemoth like Spesh then they simply aren’t placing enough resources into wheel R&D, etc. Love their 1×11…LOVE the Pike fork (best fork i ever rode), but I don’t think they’ll get any traction on these wheels until the catch up with the cutting edge. Yes, wider is soooo much better. I have Derby’s, Dually’s and will get the Stans Hugo’s for my 29+ once it’s built. A bit off-topic but whats the jersey you have on in the first pic? >>A bit off-topic but whats the jersey you have on in the first pic? Jersey is Specialized. They have a massive line of styles now. Thanks very much – Like the look of that. Why is everyone harping on weight and width. If you look around and see whats out there that is comparable, you will realize that these are actually a very attractive wheel set. Being lighter, wider and cheaper than a lot of competitors. Width is fine for xc. Price is too high if they really want to play in this market. The idea of one spoke length fitting both sides of either wheel in a set is GENIUS! New FSA SLK wheels are similar weight (29er listed on Bike Rumor) and $200 cheaper w/ 26mm outer width w/ 21 inner bead. Also adjustable bearing drag. Checking them out at dirt demo at IB. Also have an alloy version around $650’ish I think.